Greece's leftist PM, Alexis Tsipras, has announced that the EU and IMF bailout of the country’s debt has failed, and that Athens doesn’t plan to ask for an extension. However, he admitted the possibility that a transitional agreement with lenders could be negotiated by the end of February in order to to tide Greece over, in the hope that a new debt pact could be reached. The deadline for the EU and IMF bailout of the Greek debt has been set for February 28. Greek officials, including finance minister Yanis Varoufakis, have insisted that Greece does not want an extension of the bailout, but rather a bridge deal which would give it time to present a new proposal. On Saturday, speaking at a government meeting, Varoufakis, promised to hand his EU counterparts a transitional plan for managing new debt and reform program next week. The EU finance ministers are set to hold a meeting on the Greek bailout program on Wednesday. In January, President of the European Commission, Jean-Claude Juncker, said that the EU is not planning to write off Greece’s external debt. “There is no question of canceling the Greek debt. Other eurozone countries will not accept this,” Juncker said on January 29, as quoted by Le Figaro. He also made clear that Brussels did not want to threaten Greece and it is open to dialogue. The Greek government was forced to implement austerity measures in exchange for a €240 billion bailout from the troika of creditors – the ECB, IMF and the EU. The bailout was paid in two parts - in 2010 and 2014. During his speech before parliament on Sunday, Tsipras also pledged to fulfill his pre-election promise of giving free food and electricity to those who suffered from austerity. In addition he announced cuts that would be imposed on government officials’, such as a ban on ministerial cars and the sale of one of the prime minister’s aircraft. 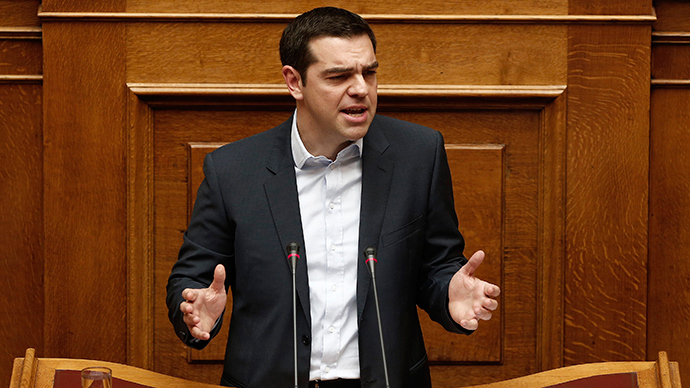 Tsipras added he would set up new measures to battle corruption and tackle tax evasion. The prime minister also promised to re-open ERT public television in an attempt to “repair a crime against Greek people and democracy.” ERT was closed in 2013 as part of the previous government’s austerity measures. His left-wing Syriza party swept into power after winning parliamentary elections in late January with promises to enact anti-austerity measures that included writing off part of the ‘troika’ debt. Greece’s debt has been a major point of irritation in the EU, with some international creditors starting to question Greece’s membership in the union. “Europe will continue to show its solidarity with Greece, as with other countries hard hit by the crisis, if these countries carry out reforms and cost-saving measures,” said German Chancellor Angela Merkel in an interview with the Hamburger Abendblatt newspaper published on January 31. Russian Finance Minister Anton Siluanov said that Moscow wouldn’t rule giving a loan to Athens, though Greece hasn’t outright asked for it. “Well, we can imagine any situation, so if such [a] petition is submitted to the Russian government, we will definitely consider it, but we will take into account all the factors of our bilateral relationships between Russia and Greece, so that is all I can say. If it is submitted we will consider it,” Siluanov told CNBC in an interview in Moscow on January 29. His statements followed Greece’s open refusal to impose further economic sanctions against Russia.